Melk town is small bit quant and is home of the Melk Abbey. This Benedictine Abbey hovers over the town on a rocky outcrop overlooking the Danube river. 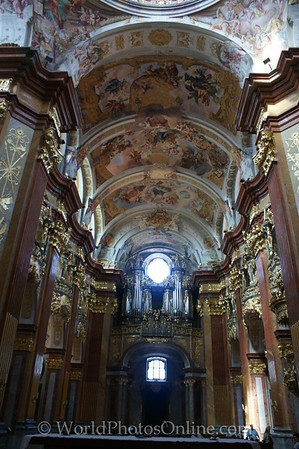 The Abbey is built in the baroque style and has a church museum, a beautiful marble hall with a hidden musicians gallery, an amazing library with an extensive manuscript collection and a church. The church interior is beautiful with gold and marble everywhere. The frescos in the ceiling and walls are amazing and many of the side altars are reliquaries holding the remains of saints. It has a wonderful organ and if you are lucky you will hear the teen choir singing.